UPDATE: MIKE MATARAZZO IS DEAD but BLAMED STEROIDS WHILE ALIVE! 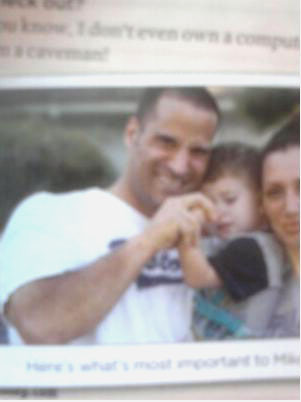 Yesterday – August 17th of 2014, Mike Matarazzo died of complications due to his steroid use. Mike’s origins were from the Boston area though he transitioned to southern California in pursuit of his bodybuilding dreams. With definite success as an IFBB card holder, he competed in many competitions along with Shawn Ray, Chris Cormier, Dorian Yates, and Kevin Levrone. On too many occasions, Matarazzo flirted with death including (a) severely clogged arteries in 2004 and (b) life-threatening complications that warranted open-heart surgery in November of 2007. Common among steroid users, arteries clog as a result of a few reasons including increased production of red blood cells to the extent that they clot and overwhelm the heart’s ability to pump blood. Additionally, poorly performing regulator valves within major veins and arteries fail to open & close properly. This leads to the highly vascular look that amateurs desire; completely unaware that this is actually an outward sign of significant cardiovascular health decline. 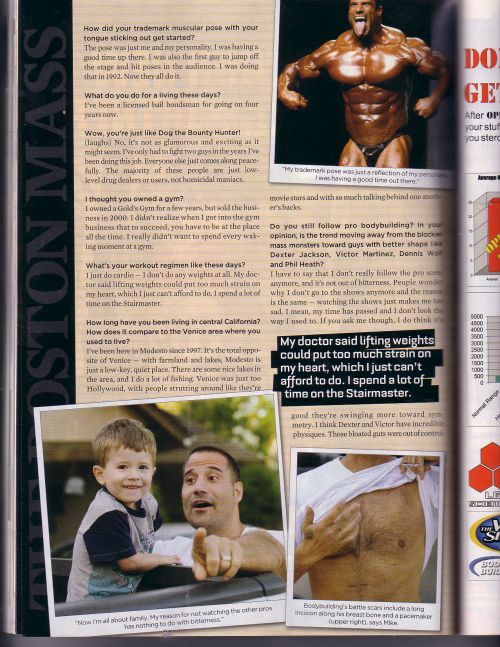 As is the case with other bodybuilders who’ve died as a result of their steroid use, their images are still circulated and used in blogs/forums, muscle magazines, etc… as though were no negative correlation between steroid/hormone use and the ultimate penalty for such PED usage. Smiling images of Ed Van Amsterdam, Nasser El Sonbaty, and others are often splashed across websites to support the façade of the steroid lifestyle including (a) optimal health, (b) the notion of super human strength, and (c) persistent sexual overtones. Again: NOTHING CAN BE FURTHER FROM THE TRUTH! Too infrequently, a former steroid user will publicly offer a testimonial to warn potential users of similar consequences. To our amazement, bloggers on forums were in complete denial, attributing Mike’s heart issues to secondary contributing factors such as high-fat diets, excessive protein intake, and other anomalies. Despite obvious red flags, member chats reverted to Mike’s Pre-Steroid photos rather than the breaking news that was virtually in front of them. Nonetheless, Mike Matarazzo’s warnings remain as clear today as they were they day he articulated them to a reporter during a candid interview. There are some guys who claim steroids aren’t dangerous, while others say using them is like playin’ roulette. Do you personally feel that steroids were a major factor in what happened to you? I know it was the drugs that caused this to happen and I don’t care what anyone says. All the gurus and self proclaimed steroid experts who try to down play the risks are talking out there asses. They have no idea what will happen to people. Nobody in my family EVER had heart problems it WAS the steroids I took. Anytime you put an artificial drug in your body your takin’ a chance. Most guys think nothing will ever happen to them just watch I bet we will be seeing more serious heart problem and worse when they get to their 40’s. Mike’s realization came too late for his own personal benefit. His wife Lacey and surviving family members can not claim anything from the testimony that he offered. The only true benefit would have been realized if Mike Matarazzo had not engaged in steroid/hormone stacks at all. Nevertheless, we at www.steroidanalysis.com express our best regards to the family and appreciate Mike’s warnings for future reference. ENOUGH SAID! I love your site and wear the t-shirt to draw more support. I love lifting and have never been involved with any steroids/HGH. It’s awesome to lift the same weight as someone who is 50%+ heavier than myself and “appears” in shape. Does being very vascular always mean that one’s valves are not functioning properly? Since I started lifting (April 1, 2001) I have always been very vascular.. I do get doctor checkups and have even been to a cardiologist a couple years back who didn’t find any issues with my heart. Feedback would be appreciated as this article may scare people who are your fans but find themselves being vascular naturally. This is a very sad story. My thoughts are with his family. It’s all true; steroids can destroy your life. But it is sad that the message is not getting thru and way too many champions and former champion are dying way too young. Mike Matarazzo was a great champion and a good man, and he told the truth but no one wants to hear it. Why? you ask? Because the fitness industry is vested in these kinds of blown-up steroid bodies to sell their products and they suppress the truth. It is time the truth be told, and heard…..before these corporations destroy all our health. Let’s revive bodybuilding and save it from the sludge of the mud where they have dragged it through. Well said, i remember seeing Mike in Golds Venice in the early nineties. I weighed 220 pds and felt like a shrimp next to guys like that . deny the health risks but they are still there. “A major determinant for bodybuilding success was how much drugs your body could tolerate”.